Anti-tax crusader Grover Norquist sat down with the National Journal recently to talk tax cuts, Republican majorities, and … the impeachment of President Obama. Let’s start with Norquist’s ideal outcome in the 2012 elections: “If the Republicans have the House, Senate, and the presidency … you extend the Bush tax cuts out for a decade or five years.” The impeachment part comes if Mitt Romney or Newt Gingrich happen not to win the White House. 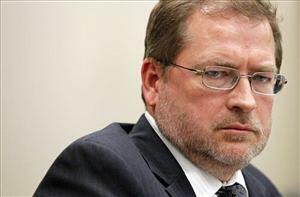 via Grover Norquist: Soon It’s Time to Impeach Obama – Anti-tax advocate reveals plan for Republican majority. Pingback: Norquist, “Impeach Obama” for crimes against the 1% « Reclaim America From The Lunatic Fringe!